The objective of the Scheme is to provide financial assistance to the differently-abled students to enable them to pursue professional or technical courses from recognized institutes and get employed/self-employed. To start with every year 2500 scholarships will be provided to the differently-abled students throughout the country. 30% scholarships will be reserved for girls, which will be transferable to male students in case of non-availability of female candidates. (i) Non-refundable fees shall be fully awarded in case of Government/Government-aided institution. In case of private Institutes the reimbursement would be restricted to similar courses in Government/Government-aided institutions. (ii) Maintenance allowance will be paid to the students for a period of 10 months only in one academic year at following rates. i) Financial assistance will be given to pursue degree and/or post graduate level technical and professional courses from a recognized institution. ii) Scholarship will be awarded for only one course at a time. iii) A candidate who is awarded scholarship for one course, after its completion will be eligible for another course too. iv) A scholarship holder under this Scheme will not avail any other scholarship/stipend for pursuing the course. v) The annual income of the beneficiary/parent or guardian of beneficiary should not exceed Rs. 3.00 lakh from all sources. Application in enclosed prescribed format shall be submitted at any time during an academic year to the assigned agency. An advance copy of the application should also be submitted on line. To Apply for Online follow the below steps. Step 2 : Then Click on the 2500 Scholarships(2017-18) link in the left side of the home page. Step 4 : Read the instructions carefully and Click To Register link in the bottom of the page. 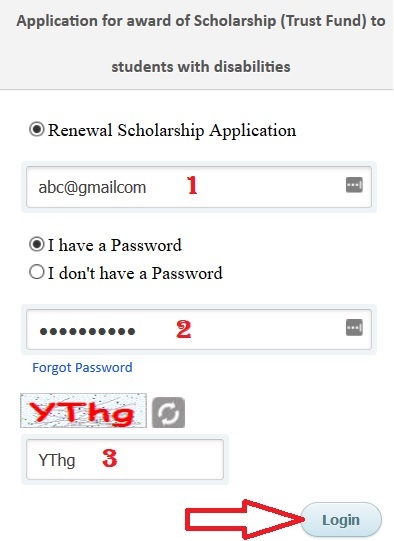 Step 6 : In case of Renewal of Scholarship Application you have to enter your Email Address and Password. Each applicant shall be given a registration number on receipt of the application. The screening committee shall examine these applications quarterly and the scholarship amount will be disbursed. i) Academic record – attested copies of relevant certificates/mark sheets for the qualifying examination. vii) In case of continuation of scholarship in a succeeding year, a copy of the mark sheet of the preceding year.